From early on in scripture there is seen a vast difference between the ways of man and the ways of God. The ways of man are geared towards evil and self centeredness, so much so God had to destroy His own creation. Since that time God saw to it that man had commandments and judgment’s to live by. He gave a plan that would work for all mankind should they choose to follow it. By doing His will and not our own He will have mercy upon us and the gift of pardoning our sin. 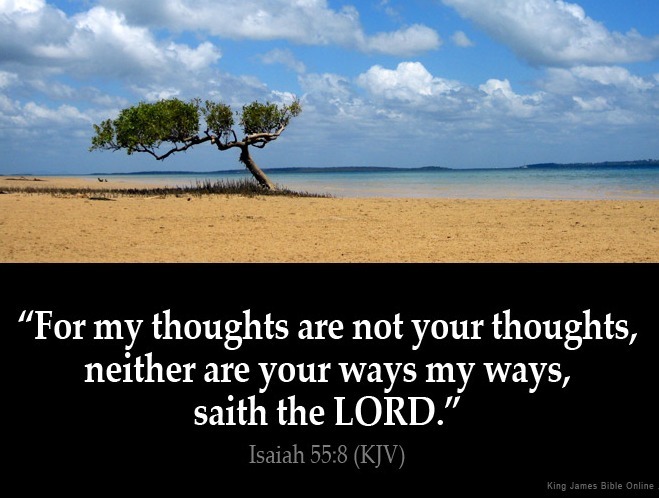 Our concern in this life is to not focus on those forsaking the Lord, but that we ourselves are in line with following His ways and not our own(Isaiah 55:6-13), 6 Seek ye the Lord while he may be found, call ye upon him while he is near:7 Let the wicked forsake his way, and the unrighteous man his thoughts: and let him return unto the Lord, and he will have mercy upon him; and to our God, for he will abundantly pardon.8 For my thoughts are not your thoughts, neither are your ways my ways, saith the Lord.9 For as the heavens are higher than the earth, so are my ways higher than your ways, and my thoughts than your thoughts.10 For as the rain cometh down, and the snow from heaven, and returneth not thither, but watereth the earth, and maketh it bring forth and bud, that it may give seed to the sower, and bread to the eater:11 So shall my word be that goeth forth out of my mouth: it shall not return unto me void, but it shall accomplish that which I please, and it shall prosper in the thing whereto I sent it.12 For ye shall go out with joy, and be led forth with peace: the mountains and the hills shall break forth before you into singing, and all the trees of the field shall clap their hands.13 Instead of the thorn shall come up the fir tree, and instead of the brier shall come up the myrtle tree: and it shall be to the Lord for a name, for an everlasting sign that shall not be cut off. (Titus 2:11-15). The saying “The more things change, the more they stay the same” is seen in scripture that after so many generations come and go in the earth we could ask how far has man really come? for when the time comes for our Lord to return will He find faith in the earth as the times will be perilous and chaotic(2 Timothy 3:1-7). Julia, I just want to confirm that you are indeed being led by the Holy Ghost. I am sitting in a starbucks in Texas with my laptop and my KJV. I just now read that very scripture in Isaiah. I look up and see this post. We don’t always understand our Father in heaven and his Holy ways. Our best bet is to keep our eyes focused on Jesus Christ resurrected to see the image of the invisible. Donald John……While the world is busy their you are in a public place with your bible open. So good to hear when the Holy Spirit moves through the earth. Thank you for your kind comment. Stay strong in HIM. Psalm 131:1 God Bless You.